Oh, look! It’s a ventriloquist dummy! And there is a creepy finger making the “shush” sign in front of him! Scary! Honestly, this strikes me as neither creepy enough to appeal to old time horror fans, nor disgusting enough to appeal to the SAW and Hostel crowd. It also doesn’t tell us much interesting about what to expect from the movie. Sure, we know there is going to be a dummy, probably killing people. But that is not enticing enough. When I first looked at this poster I immediately knew someone was going to get his leg cut off. Added with a little plot information I soon deduced someone would cut their own leg off. And honestly, that’s what got me into the theater. 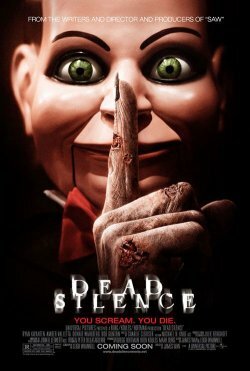 Call me sick if you want to, but I’m in the general demographic that Dead Silence is aiming for. One last thing. In the top part of the poster we see the line “From the Writers and Director and Producers of SAW”. That is not a little clumsy, that’s really clumsy. Surely they could have written “From the creative force behind SAW” or “From the makers of SAW”, or something like that. 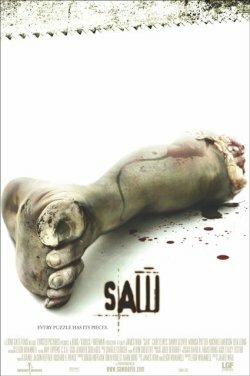 People who care that this movie has the same director and producer and writer as SAW probably already read about it in the Internet.